Published in 2005 by New World Library, Body of Health explores the science behind the mind/body connection. As a supplement to her books, Dr. McCartney also has an eight hours of audio teachings and meditations available. 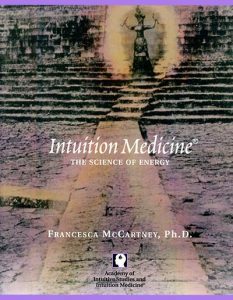 in January of 2001, Francesca published her debut book, Intuition Medicine: The Science of Energy. Since 1976, Dr. McCartney has worked in the field of intuition as a medical intuitive in an integrative health clinic, a spiritual counselor, author and educator.In 1984, Francesca McCartney founded the Academy of Intuition Medicine® in Mill Valley, California USA. Francesca synthesizes her decades of study in Eastern and Western spiritual and healing arts into an inclusive approach which respects both the inherent uniqueness of the individual and the commonalities that bind us all together. From her pastoral counseling and medical intuitive work with thousands of clients Francesca developed the Intuition Medicine curriculum. Dr. McCartney is the inaugural recipient of a dual PhD in Intuition Medicine and Energy Medicine. In 1966, Francesca received Laboratory Technician (hematology) certification from St. Joseph Mercy Hospital, Michigan. From 1968 to 1973, she studied Eastern mysticism—Divine Science of the Soul with Kirpal Singh. She also studied the Western mystical traditions of Theosophy and the Rosicrucian Society. She has been a licensed nondenominational minister since 1976. Francesca received her Montessori teaching credential at the University of California, Santa Barbara in 1974. She directed three Montessori preschool programs in Northern California. In 2002 she received her doctorate degree with honors in Energy Medicine and Intuition Medicine® from Greenwich University. In 1976, Francesca joined an alternative medicine clinic, the Academy of Eastern Medicine, in Walnut Creek, California where she was the meditation instructor and medical intuitive for seven years. Through her work there she became one of the first professional intuitives to practice an interdisciplinary modality combining Eastern and Western healing arts in a holistic system. In 1980, she was co-speaker with Dr. Alan Charles, MD on a talk entitled “The Effects of Energy and Color in Health and Behavior” at the International Academy of Preventive Medicine’s annual conference in Denver, Colorado, USA. During the conference, she led daily meditation workshops for the members. Her studies continued with training in Homeopathy, Radionics, Nutritional Therapy, Ayurvedic Medicine, Reiki, Qi Gong and Huna Healing as well as the practices of Tai Chi and Yoga. In 1984, the San Francisco Examiner newspaper interviewed Francesca for a story on predictions, and Gnosis magazine published a story about her intuitive healing work. 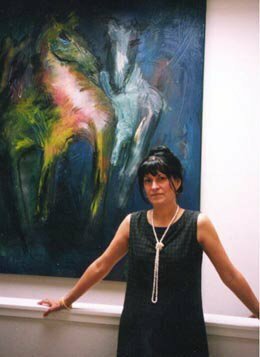 In 1990 she was a founding member of the USA branch of the Kundalini Research Network and wrote a chapter on “Paranormal Experiences” for their international questionnaire. During this time, she was also a staff writer for Psychic Life magazine. In 1990, Francesca published her own audiotape set — The Intuitive Development Series. 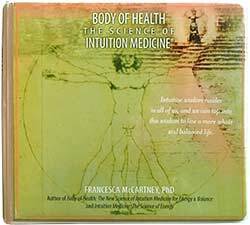 In January of 2001, Francesca published her first book, Intuition Medicine: The Science of Energy, and recorded and published eight audiotapes that cover various aspects of Intuition Medicine: Grounding System, Aura/Life-Force and Earth Energy System, Energy Anatomy of the Chakra System, Kundalini Energy Anatomy System, Color Meditations, Prosperity and Synchronicity, Creating Healthy Relationships, and Male/Female Energy Anatomy System. In 2002, the Institute of Noetic Sciences funded a seed grant and gave Francesca permission to conduct research in their Ganzfeld laboratory on the topic of Distance Healing. In July, Dr. McCartney presented her research paper “Distance Education: Utilizing Intentional Intuition in the Curriculum of a Distance Learning Model of Energy Medicine” at the at the L’Aquila, Italy IPSI Scientific Forum. In December 2003, Dr. McCartney’s paper — “The Conscious Internet: An Empirical Study of the Transmission of Healing Energy via Email” — was published in Dynamical Psychology – An International, Interdisciplinary Journal of Complex Mental Processes. In May 2004, Dr. McCartney presented a research paper on Distant Healing at the annual conference of the Society for Scientific Exploration. In June 2004, Francesca presented the Distant Healing research at a session during the annual conference of the International Society for the Study of Subtle Energy & Energy Medicine. As well, the Distant Healing research study was published in the The International Journal of Healing & Caring. 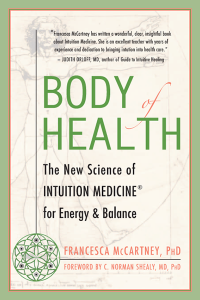 In 2005, another book on her model of Intuition Medicine, energy and healing – Body of Health: The Science of Intuition Medicine was published by New World Library. She is also at work on a book of intuitive development stories for children and their parents. In 2006, Dr. McCartney expanded the Academy and founded Energy Medicine University. EMU is a distance-learning university granting PhD and MS degrees in Integrative Holistic Health. In 2007, Dr. McCartney was invited to teach a five-day, hands-on training at Omega Institute of Holistic Studies in Rhinebeck, New York, where she returned to teach again in 2008 and 2009. In 2008, the ISSSEEM Journal published Dr. McCartney’s peer reviewed research report on distance healing and intuition. In 2011, Dr. McCartney was a featured speaker at the Society for Scientific Exploration Conference: SSE at the Forefront of Science, in Boulder, Colorado. In 2013, Francesca was interviewed in the magazine Spirituality & Health on the topic of Energy Medicine. The title of the article is Reclaiming Energy Medicine: Making The Science of Energy a Twenty-First Century Respectable Health Care Choice. In 2017 Dr. McCartney created the Academy of Intuition Medicine® Online school.